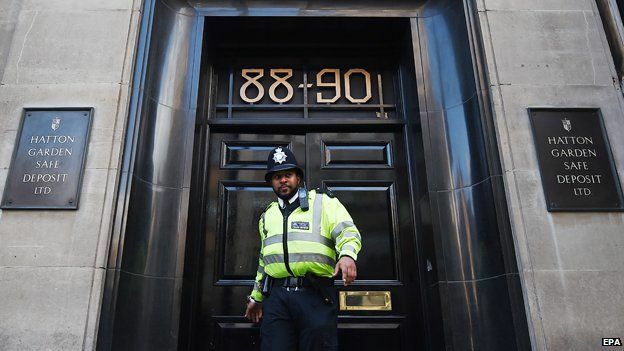 A raid in London's jewellery district has affected the owners of many safe deposit boxes. Once they stored people's most treasured possessions, now they're a service that banks no longer offer. What's inside them these days? In vaults and strongrooms below ordinary streets are rows of locked containers filled with secrets and treasure. The contents of each is precious to someone. Valuable jewellery or crucial documents, maybe. Or papers and photographs whose worth is purely sentimental. You can picture the occasional spy stashing a false passport for an emergency getaway. A raid at Hatton Garden Safe Deposit Ltd over the weekend has reminded many people just how much expensive cargo they contain. One expert estimated that thieves might have made off with diamonds worth "hundreds and hundreds of thousands of pounds". But outside a handful of specialist locations, they're increasingly a relic of the past. Most High Street banks are phasing them out, with some closing the service to new customers and others clearing out their vaults altogether. It's now common for solicitors to store papers, such as wills, trusts or house deeds. 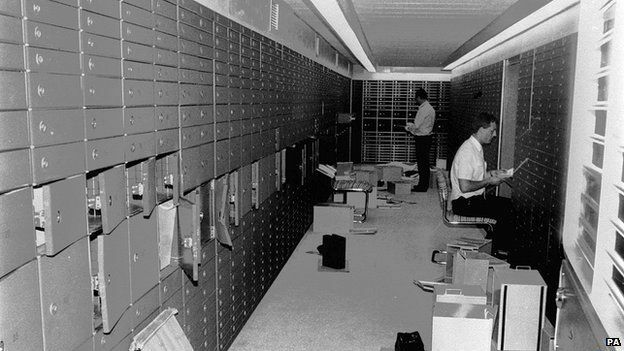 To consumers, safe deposit boxes are a throwback to the days when documents couldn't be registered electronically and people invested their savings in physical assets rather than property or intangible stocks. Nowadays, many people's only encounters with boxes are with the kind you'll find in hotel rooms with a numeric lock. But still there's something evocative about the traditional, bank-based variety - of a time when mementoes weren't all stored in a cloud or, more fancifully, of a James Bond world of microfilm, false documents and dead-letter drops. Popular culture remains captivated by them. Think of Harry Potter entering the vault at Gringotts Wizarding Bank. Or Jason Bourne finding fake documents, piles of currency and a pistol as he discovers his former identity. 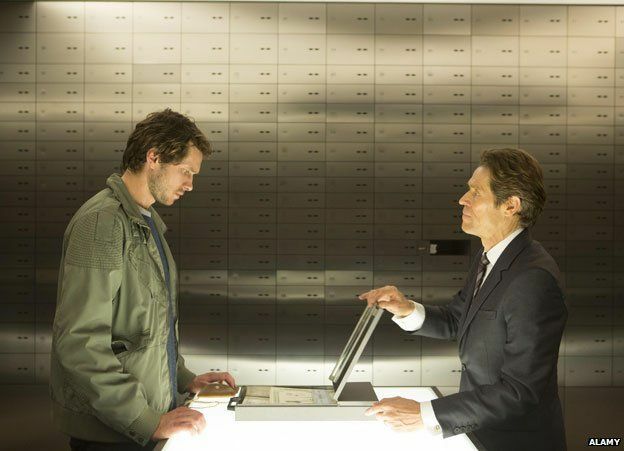 Central to the plot of the recent film A Most Wanted Man, based on a John Le Carre novel, was a safe deposit box stuffed with euros. Occasionally, they hit the headlines in ways that live up to this exotic billing. A Russian spy ring uncovered in the US used one to store fake birth certificates. Spanish tax inspectors recovered a priceless Van Gogh painting from a safe deposit box last May. But for the most part the reality is somewhat different. The core market in the UK is British Asians, predominantly but not exclusively of Indian origin, says Anil Khandelwal, 49, who last year opened Secure Deposits, a safe deposit box centre on Leicester's "Golden Mile". Asians commonly give gold jewellery as gifts on landmark birthdays and other special occasions. They favour it "for adornment value and because it's a good investment. Maybe it's part of being an immigrant," he says. "Gold is easily sellable. It's currency." But this makes British Asian communities targets for thieves, some of whom haveraided properties armed with metal detectors. It makes sense to keep precious jewellery in a secure location away from the home. Paul Riseborough, of Metro Bank, which has expanded its safe deposit network as competitors have scaled back, says its boxes are almost at full capacity in areas such as Hounslow and Slough that serve large Asian populations. But he says there is demand for the service beyond these communities too. It is popular, he says, with people who want to store "key documents that if they went up in flames would cause you difficulty - stuff that's valuable to them personally, not in monetary terms". Khandelwal says many of his clients want to keep these kind of papers in one place to make things easier for their next of kin if they pass away. Typically customers who leave valuables in banks have to pay their own contents insurance. For some companies, including Secure Deposits, it's part of the package. Rio (not his real name), 33, a British Asian from Lancashire, pays £40 a year to store a first-generation iPod, given to him at university, in a bank safe deposit box. "I never wanted to keep it, but because it was a gift I never wanted to sell it either," he says. Now it's probably worth quite a bit of money, he thinks, and its value will only appreciate. Also in the box is a £500 watch that was given to him as a present. But Rio, who works in a branch of another bank chain, can understand why providers no longer wish to offer the service. 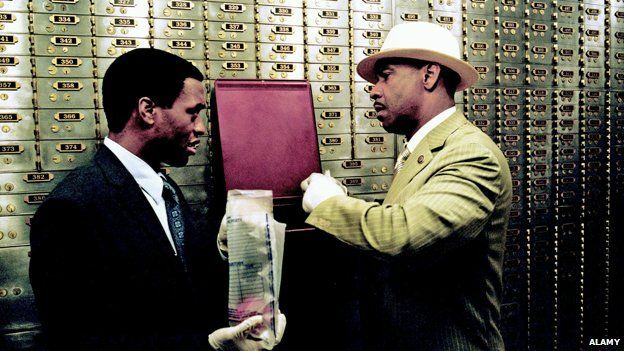 Each time a client wishes to inspect their box, the bank's protocols require that two members of staff have to go and retrieve it. Keeping track of how much each customer needs to be charged for the hire of each box is also a time-consuming and labour-intensive process, he says. The security requirements are also onerous for banks for whom looking after the boxes is no longer part of their core business. At Secure Deposits, customers have to swipe an identity card at a reader, have their photo checked by a security guard, scan their fingerprint and pass through an airlock before entering an explosive-proof strongroom and opening their box with a key. Famous raids through the decades have illustrated why measures need to be this stringent. Operators also have to comply with legislation designed to prevent money laundering and fraud. In 2008 police raided three safe deposit box centres in London as part of an investigation into claims that criminal networks were using them to store the proceeds of crime. Inside 3,497 boxes, officers found more than £50m in cash as well as five handguns, cannabis, heroin and crack, gold bars, child abuse images, three paintings by 17th Century Dutch artists, jewellery and fake passports. The owner of the centres was jailed for four and a half years in 2011. For most people who rent one, the contents of a typical safe deposit box will be far more mundane. But there's something about them that will always carry a mysterious allure.